It’s late August. There is a saying that two days of rain and wind in Cape Town are followed by Monday, but for the last two weeks the weekends have been beautiful and the cold fronts have had the decency to arrive on weekdays. So Saturday morning we headed out for a hike that is almost on our doorstep: Chapman’s Peak. Chapman’s Peak towers over the Noordhoek end of Chapman’s Peak Drive, standing guard over the beautiful beach and surf spots. Looking up at the top it seems to be a challenge for mountaineers only, but it is surprisingly easy to reach the summit. We had previously climbed it up the slightly more challenging (for me at least) route that starts on the beach. Although technically not difficult, the lower reaches of that path get a bit too close to the edge for my comfort although I did manage it with a lot of assistance from my Significant Other at the time. 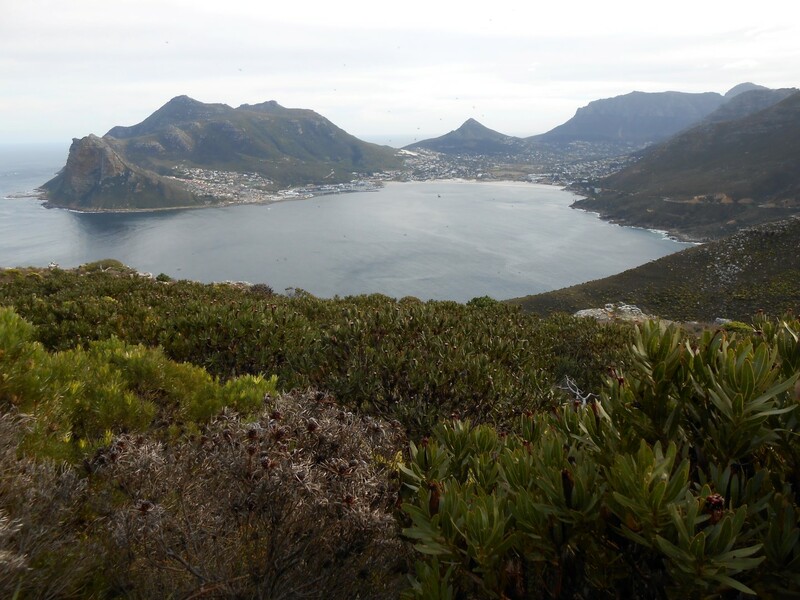 This time we started out from the Hout Bay side. The path starts at the day-pass turnaround on Chapman’s Peak Drive. We parked the trusty steed in some mud (freshly-polished tyres notwithstanding) and headed up the path. The well maintained path starts from the car park and immediately heads uphill on large stone steps following the left hand bank of the stream. In winter, look up and you will see the stream making a pretty waterfall over the rock bands between the fynbos. The path continues ever upward (there were few flat sections and no downhills on the ascent) but don’t worry, even the moderately fit can do this and it is definitely worth the odd huff and puff. After two stream crossings (which may not be there in summer) the path reaches a crossroads of sorts where it seems every loose rock has been piled onto a large cairn. Keep heading in the direction of Chapman’s Peak. 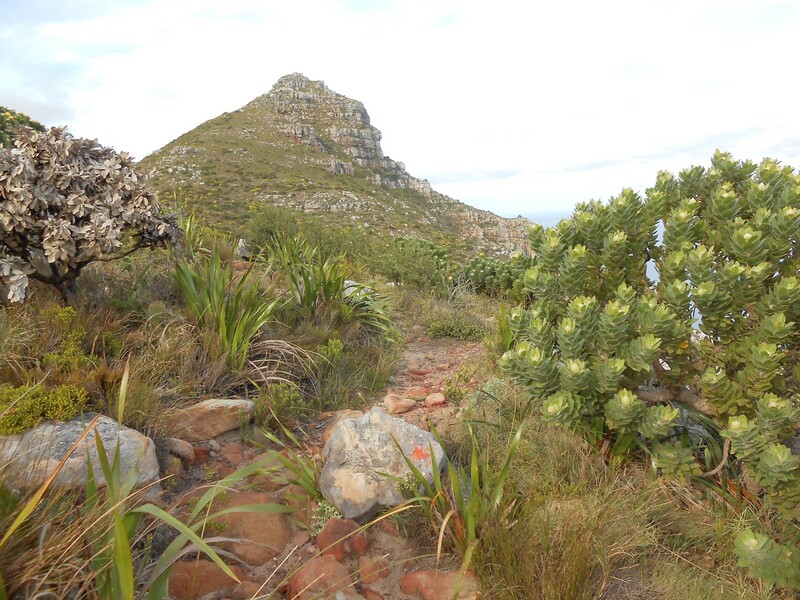 The other paths lead to Blackburn Ravine, Noordhoek Peak – looks like a serious slog straight up a very long slope – and a dead end respectively. 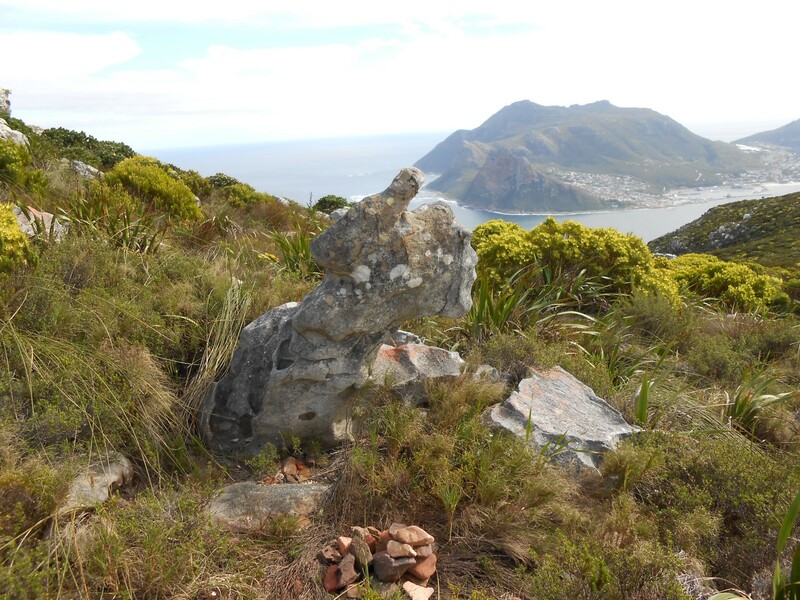 From the large cairn the path continues uphill (to state the obvious…) and skirts around lower Chapman’s Peak. It follows a sort of up-and-across, up-and-across route which gives the less fit and more asthmatic among us a chance to catch our breath and admire the beauty around us. And it really is stunning. 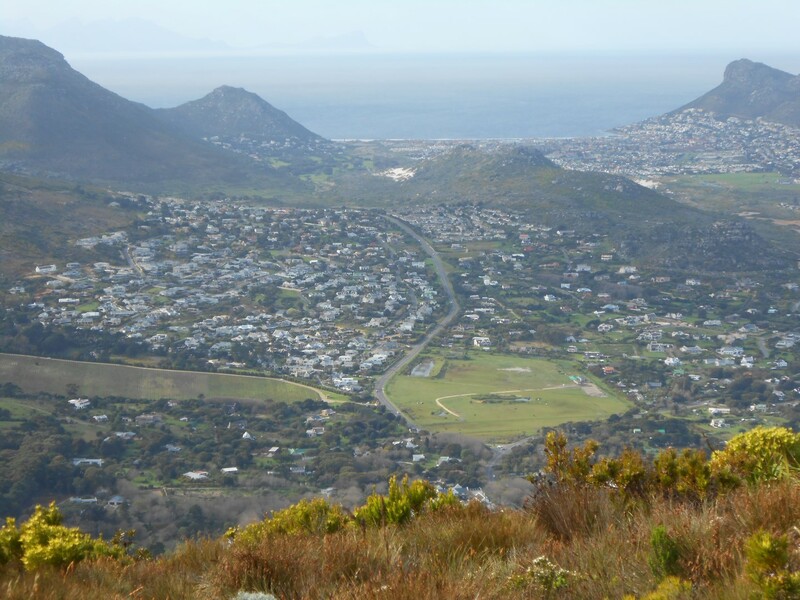 The views over Hout Bay are breathtaking and even Table Mountain is visible with the upper cable station perched on the end. But all around there are more delights. Proteas of all colours and kinds all jostling for position, slopes full of watsonias that must be amazing to see in flower, and the twitter of real birds: sunbirds and little white-eyes flitting about, sharing their own kind of social media. 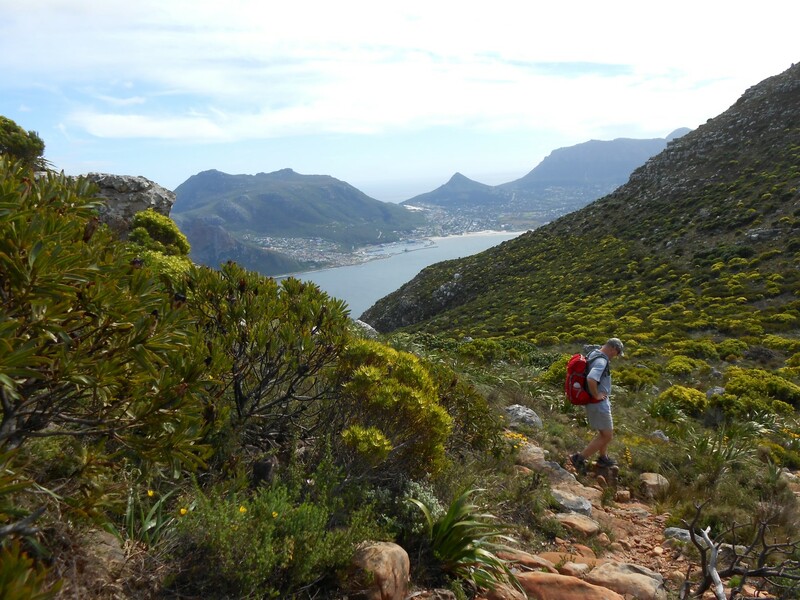 Soon you reach the saddle between lower and main Chapman’s Peak and get birds eye views of Noordhoek, Sun Valley, Masiphumelele, Kommetjie and Fish Hoek. Even Hangklip looms in the distance. The wind always seems to pump over these saddles so don’t be caught off guard. At this point I was a bit concerned when I looked at the final leg of our hike: the climb to the top seemed mighty steep… But there is nothing to be concerned about. The climb is no worse than what you have done already and 15 minutes later you have made it – you are standing atop Chapman’s Peak. We found ourselves a north facing spot out of the wind, with views of Long Beach all the way to Kommetjie to our left and Hout Bay and Chapman’s Peak Drive stretching below to our right. Significant Other had lugged a flask of filter coffee and some plastic mugs in his backpack and we wasted no time savouring the coffee and enjoying some snacks. On the way down I made lots of stops for photos and just enjoying the scenery again, especially now that the walking was much easier. Boats, planes, helicopters, trail runners, old people, students, excited kiddies, excited dogs – all part of the experience. 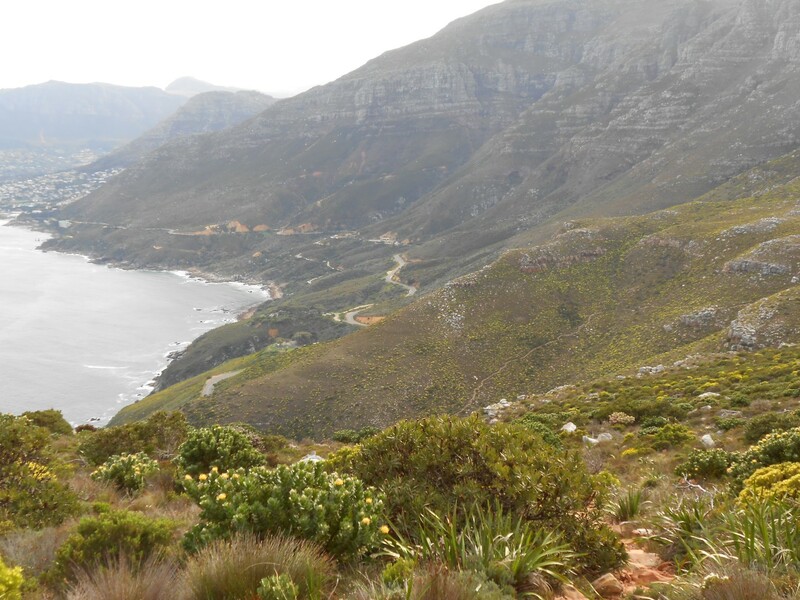 Get there: The hike starts on Chapman’s Peak Drive. Coming from Cape Town/Hout Bay side there is a toll fee payable.